Enjoy Dining at Ichigo Ichie! Ichigo Ichie stands for 'one chance, one encounter', and is the kind of hospitality we strive to achieve. At Ichigo Ichie, one can find traditional Japanese cuisine as well as a modern fusion influence in perfect harmony. Whether it's casual dining or that special occasion, we have just the right place for you. Choose to sit at the bar or lounge for a casual night out, or stay in our dining room for a more private ambiance. Looking for something a little loud and fun? 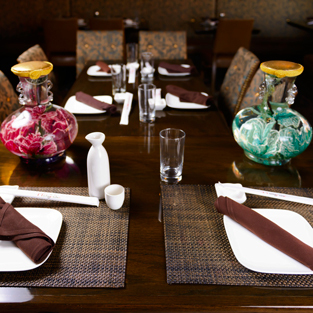 Try our hibachi room and enjoy great food while watching our chef turn cooking into theatrical entertainment. Gift Cards are available at Ichigo Ichie! A private room can be reserved based on availability. We welcome large groups, corporate functions, and private parties. Please contact us for more information regarding large groups. We would be happy to take reservations over the phone or in person. - Gift Cards are available at Ichigo Ichie!